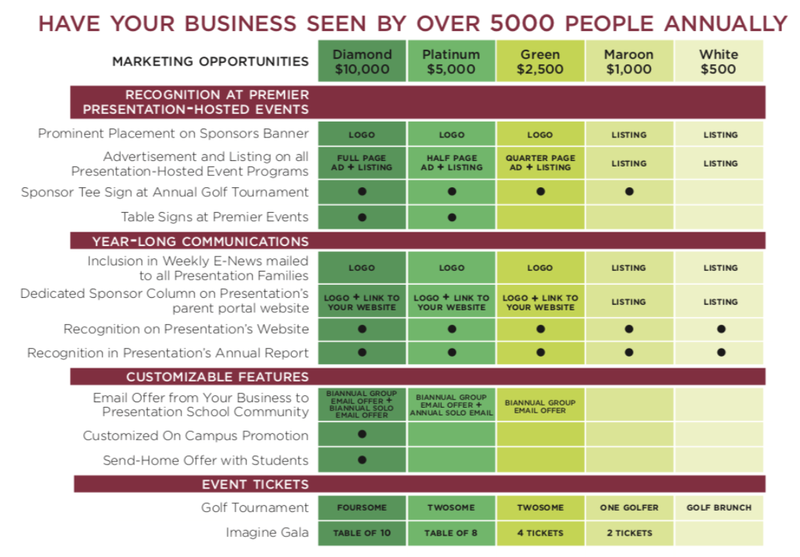 The Presentation Patriot League is a new type of sponsorship program that aims to create greater mutual value for both your business and our school. It goes beyond traditional event-specific affiliation to establish ongoing exposure for your brand across all of Presentation's key events, activities and communications. From inclusion in our weekly e-newsletters to signage and advertising at our annual Imagine Gala, Golf Tournament, Splash Day, the Speaker Series, CYO basketball, Athletic and Arts camps, theater performances and more, The Presentation Patriot League offers valuable opportunities for direct communications with our wide Presentation community. Your business benefits by having regular exposure to a highly desirable audience of community-oriented families and individuals, as well as close affinity to the most respected independent school in Sonoma Valley. Our school gains a connection with esteemed local businesses and supplemental funds to help fulfill our mission of teaching kids to Love, Learn and Lead. To have your business participate in the Patriot League click here.